You have read this article downloads / printable with the title September 2011. You can bookmark this page URL http://jenkrebs.blogspot.com/2011/09/tailgate-party-free-printable-invitation.html. Thanks! I just got ahold of a copy of the new Lexie Barnes book, Sew Up a Home Makeover: 50 Simple Sewing Projects to Transform Your Space. 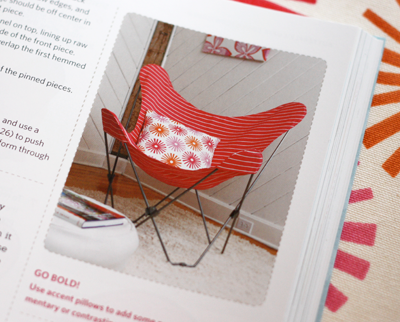 It was fun to see my fabrics featured on a few items, including this cute butterfly chair and pillow. The book is full of instructions for customizing everything with fabric: a roller shade, sofa slipcover, upholstered headboard, duvet cover, reversible placemats, marshmallow floor pouf, switch plate cover, window curtains... and a mere 42 other things. It's really too bad Lexie was running low on ideas. You have read this article books with the title September 2011. 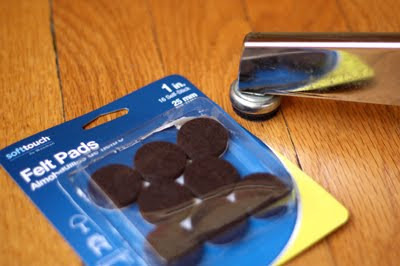 You can bookmark this page URL http://jenkrebs.blogspot.com/2011/09/useful-book-sew-up-home-makeover.html. Thanks! Friends, humans, countrymen, lend me your eyes! 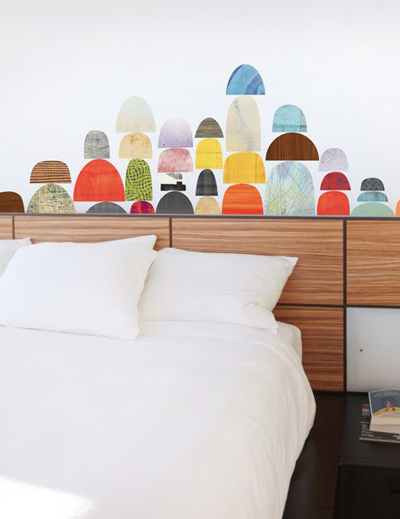 My friend Susie just sent over a link to these new wall decals at Blik, saying "You like Rex Ray, right?" Heck yes I do. While I feverishly try to think of a place to put these, you should go have a look if you like playful, retro graphics. 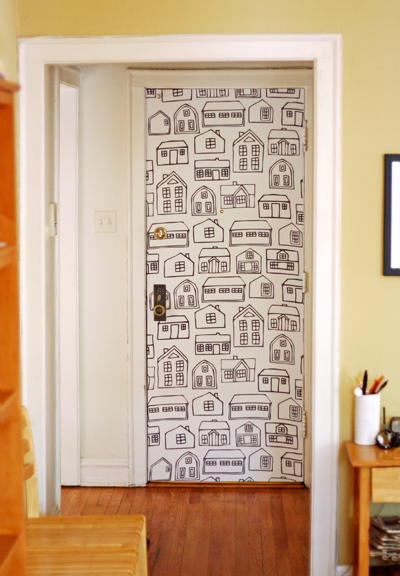 Every few months I hear someone say that wall decals aren't in anymore. Nonsense. 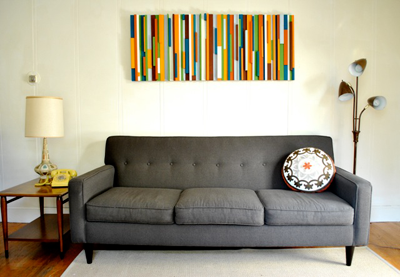 What better way to put a cool image on your blank wall, for relatively little cash, that won't harm your paint job? 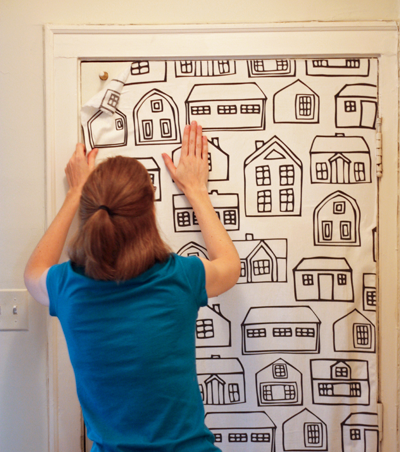 Long live wall decals! You have read this article art / shop with the title September 2011. 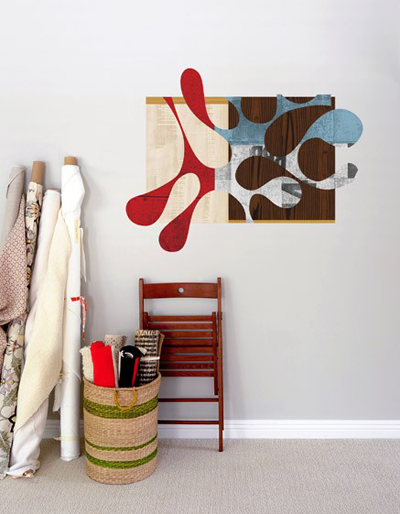 You can bookmark this page URL http://jenkrebs.blogspot.com/2011/09/rex-ray-wall-decals-at-blik.html. Thanks! Maybe you splurged on a digital SLR camera, imagining yourself taking dreamy photos like a pro. Except that you haven't quite gotten around to learning how, so your camera is permanently stuck on the auto setting. You know you can do better... but how? 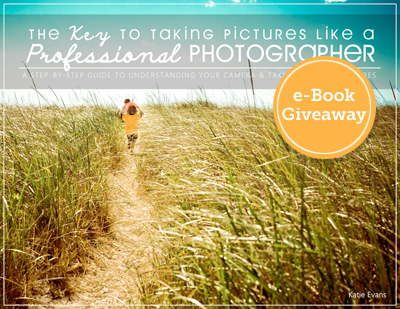 If that's you, Katie Evans' new e-book, The Key to Taking Pictures Like a Professional Photographer, will help you show that camera who's boss. Katie is giving away five free e-books, each a $35 value. Want one? Leave a comment here with your email address or other way of contacting you. And mention something interesting you'd like to photograph. (I'm betting 70% of the answers will be kids, but we'll see.) Five winners will be selected, contacted, and announced in this post. Giveaway closes at midnight CT on Friday, Sept. 30th. Interested in purchasing a book? Enter the code ORANGE at checkout and get $5 off the e-book, now through Oct. 7th. Update: The giveaway is now closed. Congrats to lucky random winners Robyn, Britt, Jolkipalki, Rachel, and Jessica! They've been contacted and will be soon be taking better pictures. You have read this article giveaway with the title September 2011. 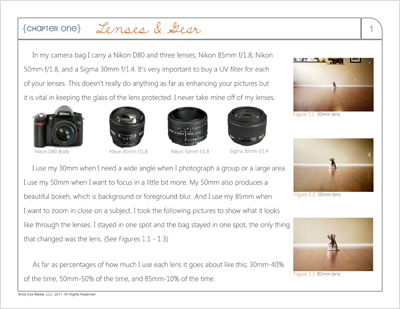 You can bookmark this page URL http://jenkrebs.blogspot.com/2011/09/giveaway-key-to-taking-pictures-like.html. Thanks! I bought a couple of oil-based Sharpies at Michael's recently—the package says they'll write on metal, pottery, wood, rubber, glass, plastic, and more. 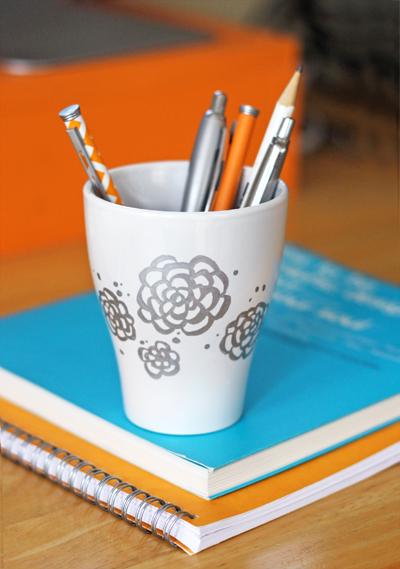 I chose a two-pack with gold and silver pens and tried one out on this ceramic cup. Nifty! The paint is opaque and shiny and didn't bead up. Now I'm plotting what else needs gold and silverizing. I'm like Midas with markers. You have read this article tutorials with the title September 2011. You can bookmark this page URL http://jenkrebs.blogspot.com/2011/09/metallic-oil-based-sharpies-nice.html. Thanks! As for me, I've got another chair makeover planned for the weekend. If it's a success, I'll show you next week. If it flops, just pretend I never mentioned it. 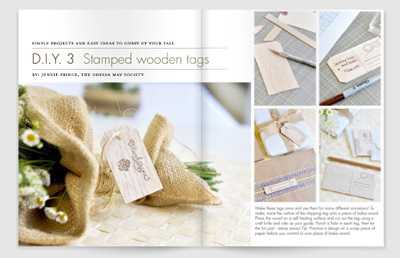 You have read this article decorating / tutorials with the title September 2011. 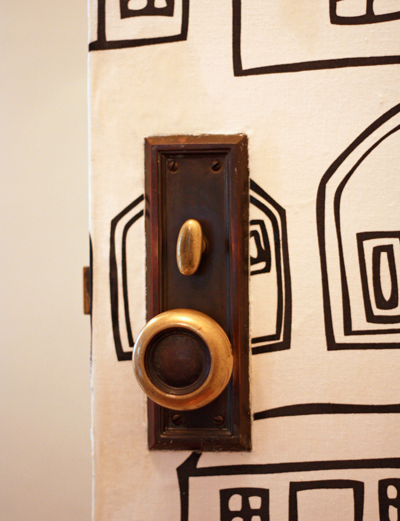 You can bookmark this page URL http://jenkrebs.blogspot.com/2011/09/make-your-own-wall-art.html. Thanks! 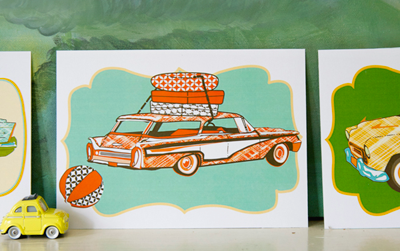 Find a pile of charming illustrations you can print out at The Handmade Home, including a set of retro automobiles. You can also download an alphabet for the nursery, kitchen utensils, campers, and more. Use them as postcards, gift tags, framed art, you name it. See all the free printables here. Also: it would be kind of awesome if I drove an orange station wagon. You have read this article downloads / printable with the title September 2011. You can bookmark this page URL http://jenkrebs.blogspot.com/2011/09/free-printable-cards-and-illustrations.html. Thanks! You have read this article fonts / graphic design / quizzes with the title September 2011. You can bookmark this page URL http://jenkrebs.blogspot.com/2011/09/quiz-typography-terms.html. Thanks! I paid my first visit to Jubilee Furniture a couple weeks ago and returned with a car full of projects. Jubilee is a giant furniture resale shop in Carol Stream, a Chicago suburb. 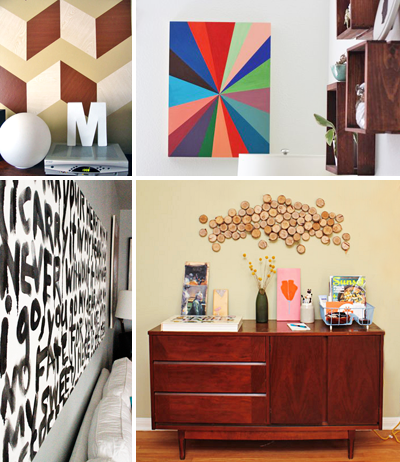 You'll find mid-century goodies mixed with more contemporary pieces—a whole lot of awesome combined with some things that look like hopeless cases to my non-expert decorator eyeballs. It's a treasure hunt. And somehow Jubilee has assembled a staff made up of the nicest people on the planet, so go visit them! Highlights from new inventory are posted regularly on their blog. But anyway. While I was there, I came upon two 1982 Steelcase task chairs begging with sad puppy eyes to be rescued. They could replace the not-very-comfy wooden dining chairs Alex and I use at our desks. 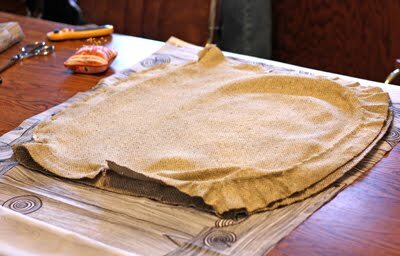 The challenge was figuring out how to get them apart and re-cover them, because the stained, scratchy burlap-like upholstery had to go. After studying them in the store it was still a conundrum, but Susan the manager cheered us on. (Hi Susan!) So into the car they went. And we conquered! 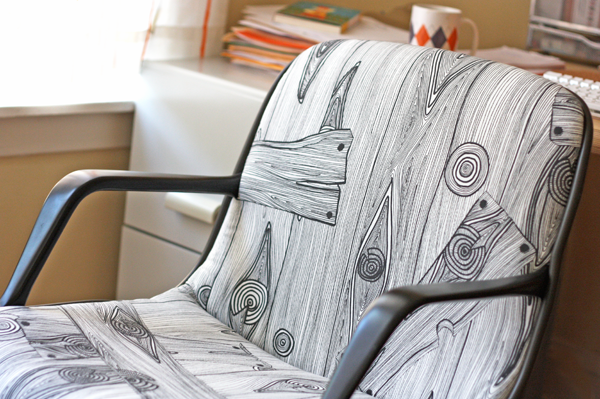 Say hello to our refurbished woodgrain office chairs. We're in love. 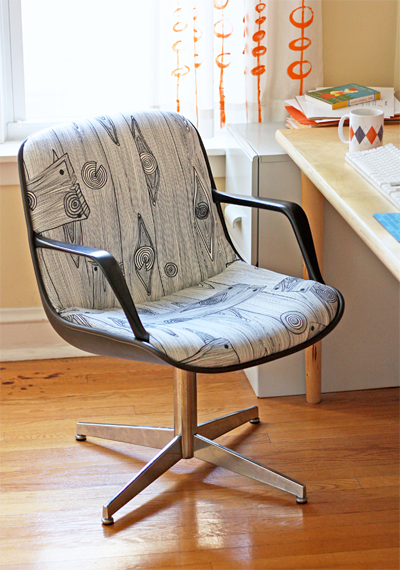 In case you, too, ever encounter a Steelcase task chair begging for a re-do, read on to see what we did. We were champing at the bit to get started on the chairs, but lacked enough free time. So we brought them along on a visit to my family in Minnesota last weekend where they turned into a family project. Everybody had a hand in this chair makeover, which you'll see in the following photos. 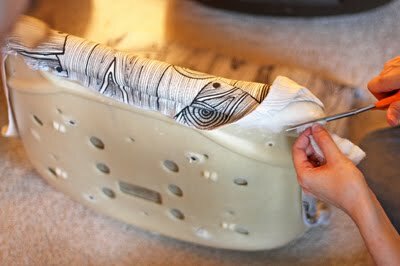 A disclaimer: We don't know anything about reupholstery, so our method is take it apart and copy what the people before us did. We easily removed the screws from the underside of the chair to get the pedestal (leg? foot?) off. Then we discovered the front of the seat was attached to the back with small screws hidden underneath a strip of plastic edging (casing? trim?). Let's call it edging. We pried the lip of the edging up with a flat screwdriver to get at the hidden screws to remove them. This involved a lot of wrestling. Good thing Alex was on the team in high school. See? These screws go in through the back of the chair, pass through the edging on the front side, and screw into the plastic back of the seat. A mystery solved. When the screws are removed, the two halves come apart. (Leave the edging attached to the back piece or it'll be a nightmare putting it back on again.) The arms are easy to detach; each is held on by two screws. Approximately 378,920 staples secured the fabric around the edges of the seat. We removed those. Mystery number two: there was a seam across the fabric where the vertical backrest met the horizontal seat. And somehow that seam was anchored to the chair. Turns out two pieces of fabric were stitched together, leaving a 3-inch seam allowance. 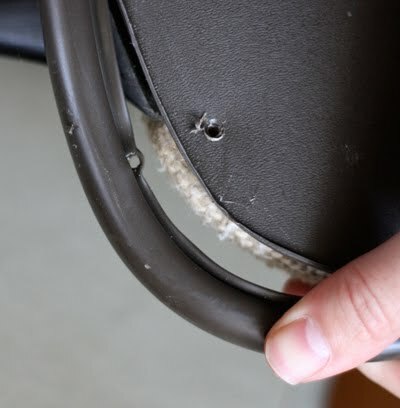 This extra flap was tucked down into the crack between the foam pieces and stapled to the bottom of the chair. We removed it and pinned the fabric onto the new woodgrain material. (Monalis from IKEA.) Using the old fabric as a pattern, I cut out new pieces and Mum sewed them together, mimicking the seams and the topstitching from the original fabric. 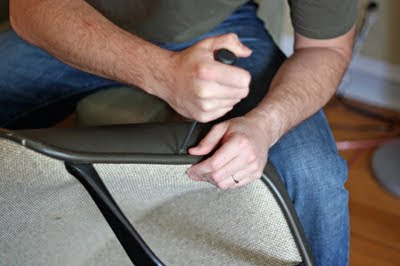 Then we stretched the fabric around the edges of the chair, stapling it in place. The old foam and batting were in fine shape, so we reused them. 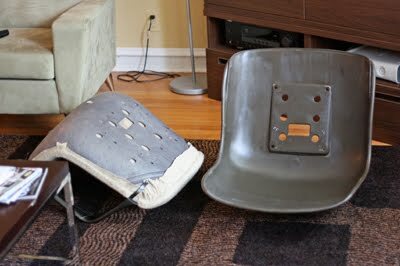 Then the arms and front and back pieces of the chair were screwed back together again. Because these chairs will be used on our hardwood floors, we put felt discs under the feet so they'll slide without scratching the floor. I'm opposed to wheels and floor mats because they're ugly. You have read this article home / tutorials with the title September 2011. 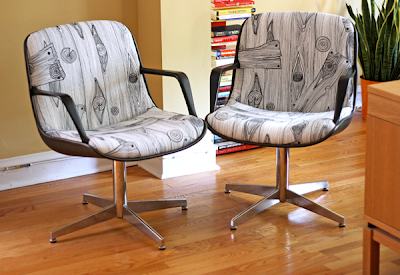 You can bookmark this page URL http://jenkrebs.blogspot.com/2011/09/reupholstered-steelcase-chair-project.html. Thanks! 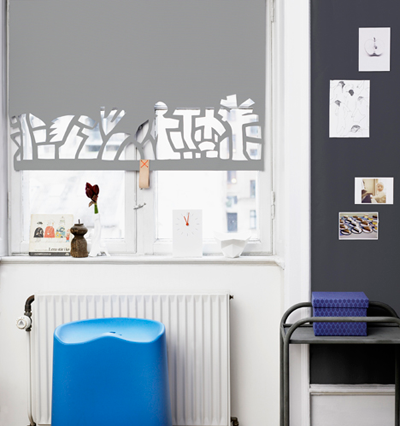 Outside Oslo, the fabric line I designed for The Needle Shop, is now stocked at Purl Soho. A beautiful store in New York City, Purl Soho has an equally lovely blog that showcases projects made from the goodies they sell. 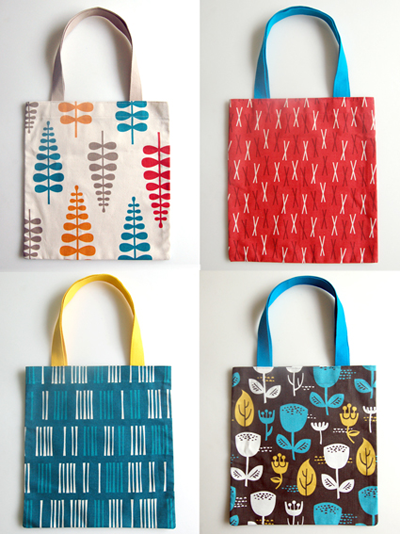 Check out these Oslo tote bags that take just twenty minutes to whip up. Find a link to the instructions in The Purl Bee post right here. You have read this article bag / design work / sewing / tutorials with the title September 2011. 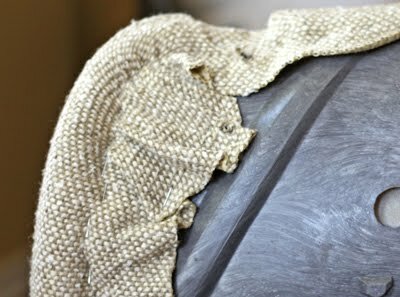 You can bookmark this page URL http://jenkrebs.blogspot.com/2011/09/make-simple-tote-bags-with-purl-bee.html. Thanks! The other night I was designing something for a friend's wedding and needed some fancy curlicues. I could make some—but I'm lazy. I opted for a quick internet search for free vector graphics and found lots of useful goodies. Plus lots more where those came from. A word of caution: you'll need to navigate through a minefield of advertising links to get these, so be careful what you click. Skip the Google ads and click "Download link" midway down the page. When directed to MediaFire, ignore all the large flashing buttons! Look for the name of the .zip file and directly underneath, choose "Click here to start download from MediaFire." You have read this article resources with the title September 2011. You can bookmark this page URL http://jenkrebs.blogspot.com/2011/09/free-vector-ornaments-and-frames.html. Thanks! 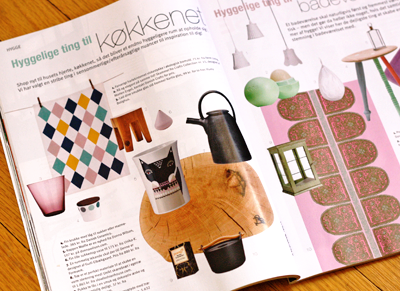 Can the Danish magazine BoligLiv be my new favorite magazine, even though I can't read a word of it? 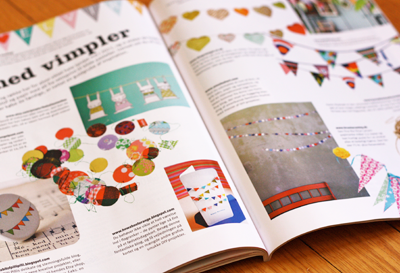 Awhile back they contacted me for permission to use a small photo of my DIY bunting birthday card, offering to send over a magazine when the September issue was printed. Guys, it's so lovely and full of products I'm coveting. Sofas! Bookshelves! Pillows! I want to make all the recipes and live in all the beautifully photographed homes. Apparently in Denmark, everything is spare and modern with a dose of quirkiness to keep it fun. 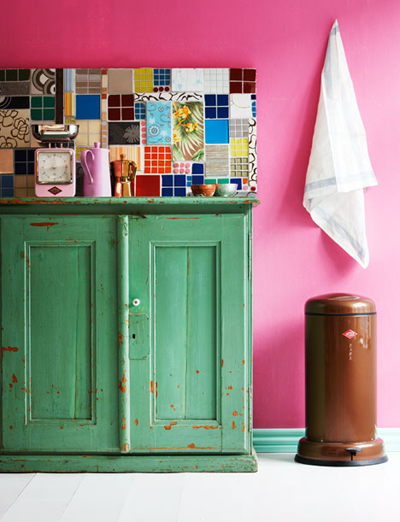 A mismatched mosaic tile backsplash, right here. Enjoy browsing! You have read this article favorite things / tutorials with the title September 2011. You can bookmark this page URL http://jenkrebs.blogspot.com/2011/09/my-new-favorite-magazine.html. Thanks! You have read this article decorating / tutorials with the title September 2011. 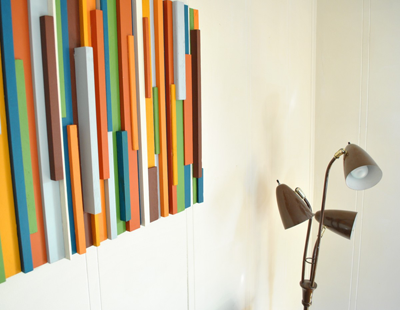 You can bookmark this page URL http://jenkrebs.blogspot.com/2011/09/how-to-make-wall-art-from-wood-scraps.html. Thanks! You have read this article giveaway with the title September 2011. You can bookmark this page URL http://jenkrebs.blogspot.com/2011/09/giveaway-jo-totes-camera-bags.html. Thanks! The folks at SweetPreservation.com are aiming to make canning cool for a new generation. They invited me to be a "canbassador" again this year, sending over a generous box of Washington state stone fruits. After my first low-budget but highly-successful canning effort last year, I was happy to try again. Though I still refuse to buy a giant pot and special tongs. And I couldn't find any pectin at the grocery store, so I went for recipes that use just fruit and sugar. 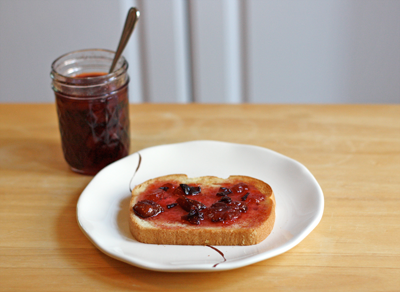 This year I made plum jam using this easy recipe, altered to a 1:1 ratio of plums and sugar as suggested in the comments. 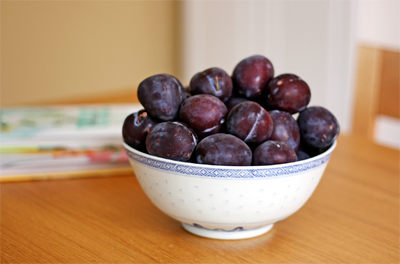 I chopped the plums up with a kitchen knife. The resulting jam is a little runnier than I'd have liked, but very yummy. The only mishap occurred when my back was turned and the pot of plums boiled over, creating a delicious lake of plum syrup on my stovetop. Oh well. I needed to clean it anyway. I made peach butter, too, with this crock pot method. The house smelled like a country gift shop all day. I halved the recipe to fit in my pot and omitted the cloves, but the peach butter is still a little too spiced for my taste. Next time I'm ditching the allspice, too. The consistency turned out perfectly, and the method for skinning the peaches worked like a charm. I also whipped up a printable freebie for some jar labels. 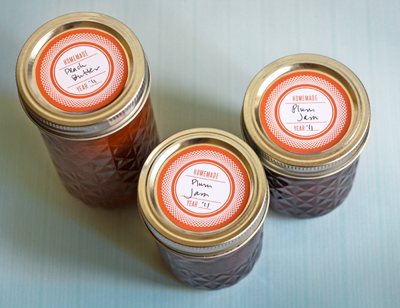 The circles are 2" in diameter when printed at 100%, sized to fit on the lids of small jam jars. You can also punch a hole in the top and tie them to a jar with baker's twine. Download a PDF right here, then print out the page and write on the labels. Check out SweetPreservation.com for more free printables and recipes! You have read this article printable / recipes with the title September 2011. 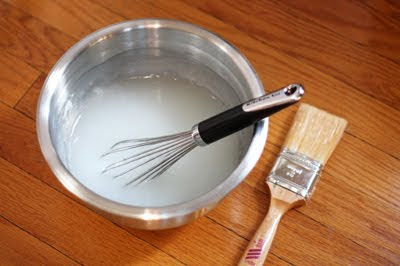 You can bookmark this page URL http://jenkrebs.blogspot.com/2011/09/adventures-in-canning-printable-jar.html. Thanks! A little fun for Friday. 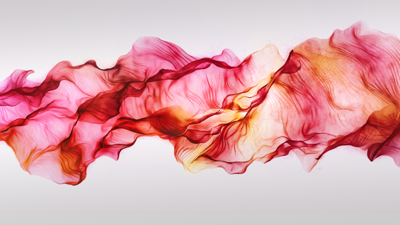 Via Jeannie Jeannie, I bumped into Silk, a site where you create artwork that resembles silk blowing in the breeze. Just click your mouse and drag. While you're over there, scroll down the page a bit and grab a set of four desktop wallpapers. You have read this article desktops / time-wasters with the title September 2011. You can bookmark this page URL http://jenkrebs.blogspot.com/2011/09/play-with-silk-online.html. Thanks! You have read this article printable / resources with the title September 2011. 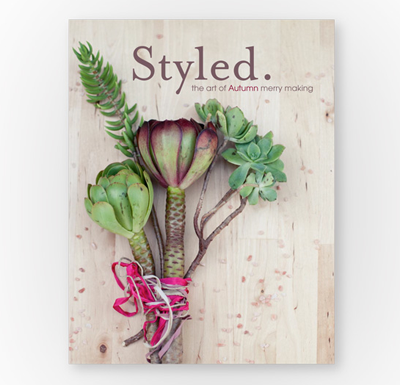 You can bookmark this page URL http://jenkrebs.blogspot.com/2011/09/styled-magazine-free-diy-ideas-recipes.html. Thanks! 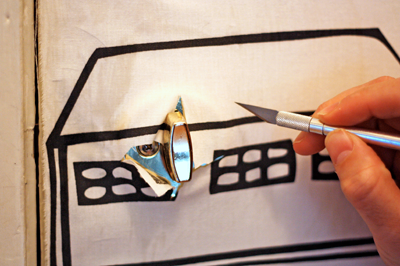 In the meantime, measure the area you want to wallpaper and cut your fabric to size. I just made small cuts in the edge of my fabric and tore each side, since I knew it would make a straighter line than I could cut. I trusted that the design was printed to be aligned with the grain. 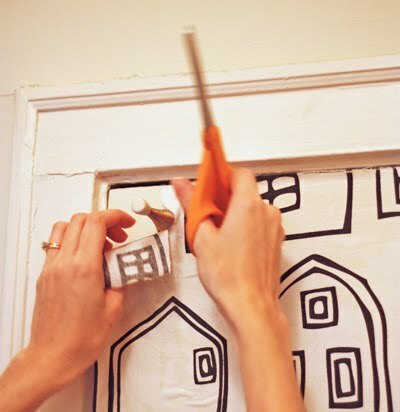 Use a scissors or Xacto knife to cut around any obstacles. We made a few quick slits where the lock and doorknob were, just to get the fabric fitted over them so we could continue smoothing out the rest of the door. Then we went back and trimmed carefully around the hardware with a knife. Apply more paste to stick down the raw edges. Finally, we back went around the sides of the door and applied a little extra paste to smooth down any loose edges. The paste will keep the raw ends from fraying. 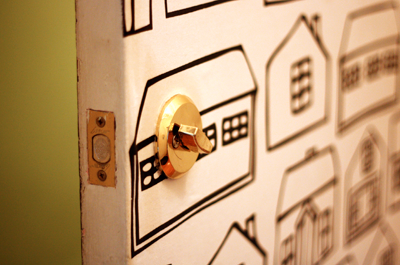 If you like, you can brush another coat of paste over the entire door, decoupage style. 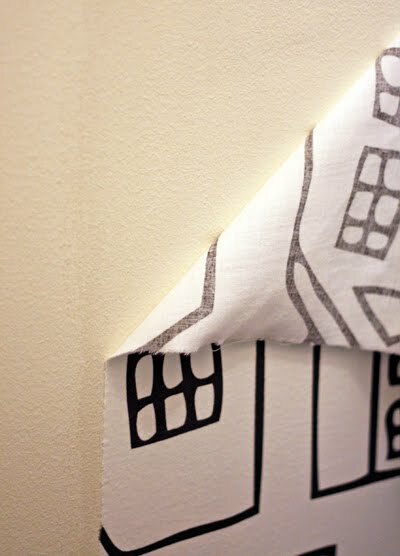 Our fabric was stuck down well enough and I liked the soft fabric texture, so I opted not to. 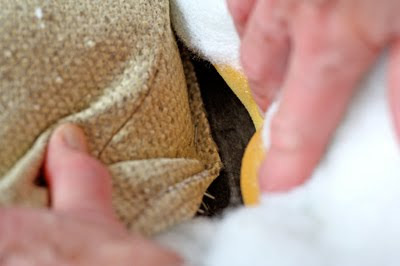 If you use thicker fabric, it might be a good idea to glue it down a little better with a top coat, though. The fabric peeled off easily. In this case, the edge of the glued area showed slightly. After taking this photo, I went over it with a damp sponge to see if I could erase it, but that just made the faintly darker area larger. The slight discoloration is the result of getting the wall damp. The walls in my hallway have flat paint, which doesn't like wetness—it always shows every water drip and isn't very wipeable. I don't mind, since this part of the hallway is dim and it doesn't show. Or I can always wipe the whole wall with a moist sponge and it will all match! 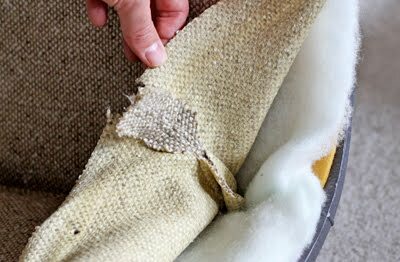 If your wall or door has flat paint, you might want to cover the whole area with fabric so you don't see any discolored edges where the fabric starts and stops. If your paint is satin or semi-gloss, which withstands moisture much better, I don't think you'll see any lines at all. You can always test a small area first. You have read this article decorating / home / tutorials with the title September 2011. You can bookmark this page URL http://jenkrebs.blogspot.com/2011/09/how-to-using-fabric.html. Thanks!